The story thus far: Dante, a poet and town prior in Florence, finds himself on a dark road of the soul. Before his spirit can fall to its ruin, he encounters Virgil, the greatest poet of classical Rome. 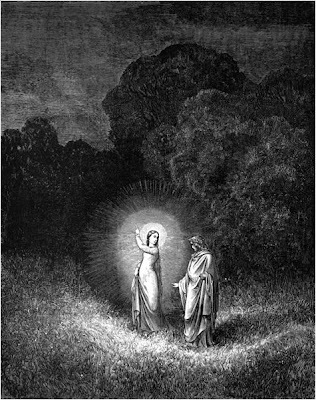 Virgil offers Dante a journey through the realms of the afterworld, through which Dante may find his soul's salvation. He shall travel through Hell, Purgatory, and Heaven, with Virgil as his guide through the first two. Dante accepts Virgil's offer, and they embark. That the unerring mind shall retrace. Here shall your nobility appear. Before entrusting me to the high road. World he went, alert and reflective. By the Father’s choice, into the empire of Heaven. Where the successor of the great Peter sits. His triumph and then the papal mantle. Which is the beginning of the road to salvation. But me, why have I come here? Who grants this? I am not Aeneas; I am not Paul. Neither I nor others believe me worthy of this. I fear it would be folly. That, in the beginning, I had quickly embraced. Like a skittish animal deceived by its own eyes. When I first grieved for you. That I asked to be of her command. Of the Journey, turned by fear. Based on what I have heard of him in Heaven. Help him so that I shall be consoled. I am Beatrice, I who compels you to go. I come from the place to which I long to return. Love moved me, and compels me to speak. No more is needed to open me to your wishes. Why I am not afraid to enter here. That have the power to do harm. Other than that, no; nothing else is frightening. That, to me, your misery cannot be felt. Nor do the flames of this fire assail me. That, there, lasting judgment from above is set aside. I sat with the elder, Rachel. That, for you, he rose above the common herd? Do you not hear the pathos of his cries? As I was after these words were spoken. Which prompted me to come, and quickly. And so I came to you as she directed. Who thwarted the short journey up that beautiful mountain. As such, what is this? Why, why do you hang back? Why is cowardice allotted so much room in your heart? The words of truth presented to you! Through your words, for what is to come. I am once again of the mind with which I began. Now go, for we are both of one will. I began upon that deep and savage road.